The story of walking away from my day job. Dalman Supply Co. brings you The Jon Lock. 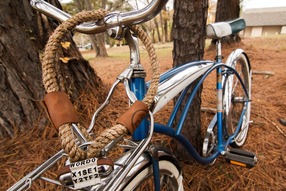 A bicycle lock that doesn't take away from the elegance of you're ride you've worked so hard to establish. 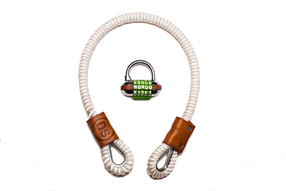 I hand make each lock with rope, steel cable, and real leather. 6.5mm thick galvanized steel cable hidden amongst the hemp manila rope is fastened with a ferrule and essentially gives the rope the strength of any standard cable lock. The rope is wrapped around a thimble and fastened into a rope clamp. The clamp is covered by leather, and fastened down with epoxied screws. 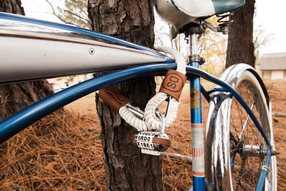 All metal is galvanized, and recessed into leather, and rope to keep the locks bike friendly. All of the leather is conditioned, waterproofed, and epoxied. These locks are built to endure the most punishing conditions and trends. 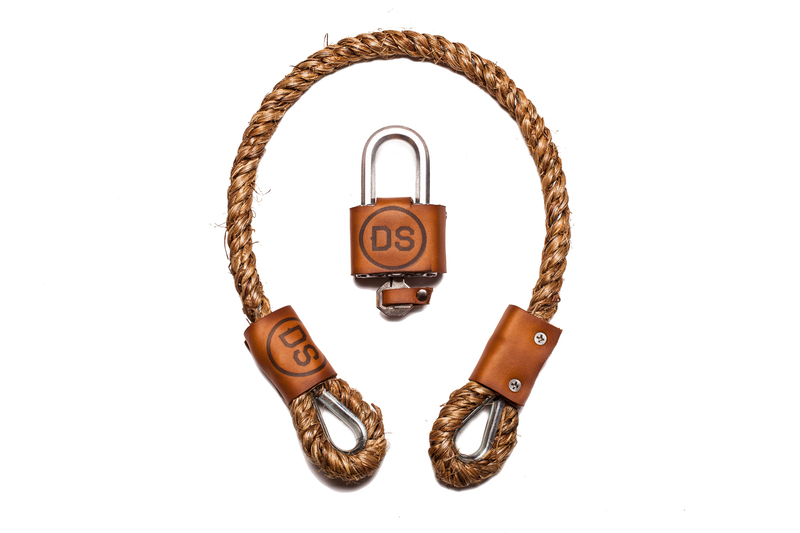 The lock is a Master Lock custom fit with hand tooled leather by yours truly, and branded with the Dalman Supply Logo. 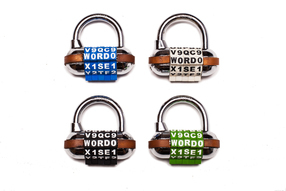 The Key Yoke is a Magnum padlock dressed in a leather coat. 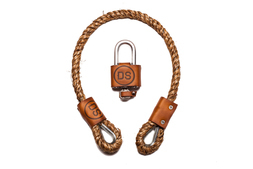 The lock is 2" wide with a shackle diameter of 2" tall by 15/16" wide. 24" rope, 1 keyed lock, or combo lock. Ask about locks made just for you. 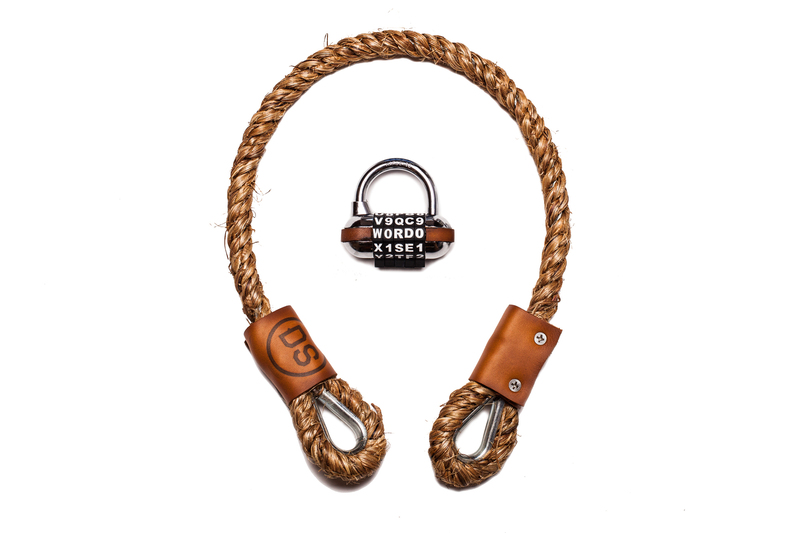 The Combo Yoke is a Master Lock with two epoxied strips of conditioned leather on either side to keep what ever you're locking up safe from scratches and thieves. The lock is 2.5" wide with a shackle diameter of 1.5" tall by 1.5" wide. The combination is resettable, and comes with 3 extra dials. Dalman Supply Co. brings you The White Jon Lock. 6.5mm thick galvanized steel cable hidden amongst the white nylon rope is fastened with a ferrule and essentially gives the rope the strength of any standard cable lock. The rope is wrapped around a thimble and fastened into a rope clamp. The clamp is covered by leather, and fastened down with epoxied screws. 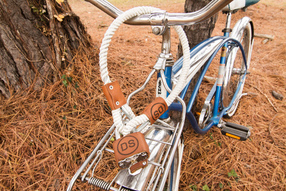 All metal is galvanized, and recessed into leather, and rope to keep the locks bike friendly. All of the leather is conditioned, waterproofed, and epoxied. These locks are built to endure the most punishing conditions and trends. 6.5mm thick galvanized steel cable hidden amongst the nylon rope is fastened with a ferrule and essentially gives the rope the strength of any standard cable lock. 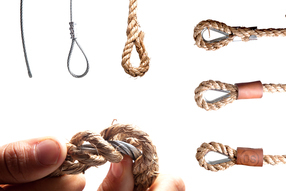 The rope is wrapped around a thimble and fastened into a rope clamp. The clamp is covered by leather, and fastened down with epoxied screws. 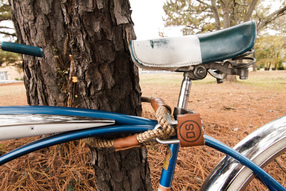 All metal is galvanized, and recessed into leather, and rope to keep the locks bike friendly. All of the leather is conditioned, waterproofed, and epoxied. These locks are built to endure the most punishing conditions and trends. If you have any questions about product care, or are unhappy with the life-span of our products, please feel free to contact us - jon@dalmansupply.com, and we will do what ever it take to make it right with you! Not responsible for stolen goods secured by our locks.